And so, like any other thing of beauty, the Holiday ends officially today. One part of me is tempted to throw a party just to celebrate the fact that there will be no hellish traffic in the streets (well, worse than the usual gridlock present in Manila streets), the phonies are back in their respective holes, no more insane sales and long lines on department store cashier and lastly, no more insipid Christmas carols. But, a big part of me is also mourning the fact that Holiday passed by and I have no freaking idea what happened. Holiday this year is just a tinseled-version of the weekend. I don’t even get to have a nice vacation in spite the fact that I was reeling from tummy ache and other unspeakable things concerning my digestive system. I was self-medicating and was miserable even if I had to haul my carcass away for work before the New Year weekend. And I come back to this. Notice the general disarray of my table. Weird as it may sound, I function well in this environment. A lot of papers inside envelopes and folders bring a semblance of order on the various projects I am spearheading. I also notice my Superman mug ever on its perch, just an arm-stretch away for my much needed caffeine fix. 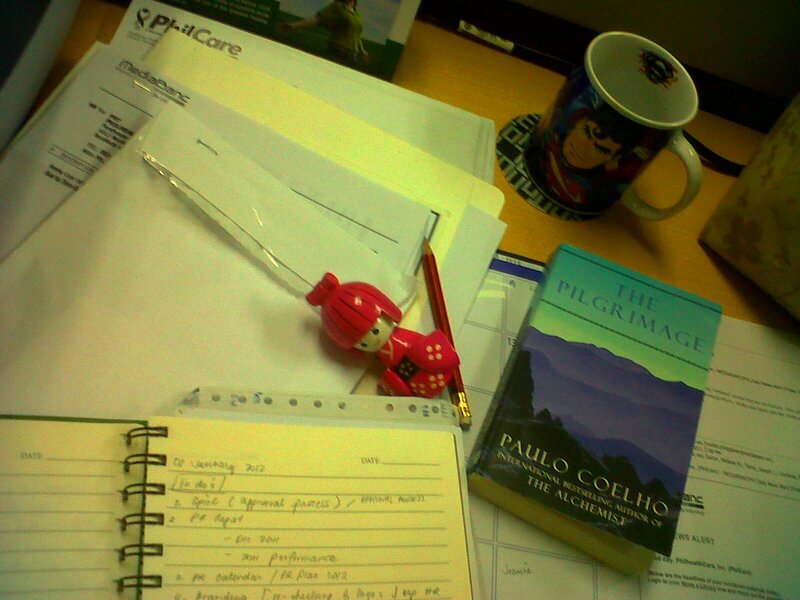 I’ve also started reading “The Pilgrimage” by Paulo Coelho, his brilliant tale about the Camino de Santiago de Compostela (The Way of St. James of the Stars). Following my short PR stint handling the Spain Tourism Board, I have become so enamored with this pilgrimage and have bowed to do once in my life, as soon as I get my money. Also making an appearance is my wooden Kokeshi doll, present in every desk table I maintained in three separate companies. Oh my God, it’s just the second day of the first month of the New Year and my every being is already screaming for vacation.